Loren Houghton married Pluma Herrick in Oct 28, 1821. Warren J. Houghton married Alzina Mason in Jun 5, 1831. Luther Russell Handy married Eunice Houghton, daughter of Luther Houghton and Anna Munro, in Mar 1, 1812 at Wyoming Co., NY, USA. Tamzin Foy married Leonard J. Houghton, son of Luther Houghton and Anna Munro, in Nov 22, 1819. Pluma Herrick married Loren Houghton, son of Luther Houghton and Anna Munro, in Oct 28, 1821. Alzina Mason married Warren J. Houghton, son of Luther Houghton and Anna Munro, in Jun 5, 1831. James Houghton married Sarah Smith in Sep 25, 1820 at Preston, NY, USA. Sarah Smith married James Houghton, son of Elias Houghton and Sarah Gilbert, in Sep 25, 1820 at Preston, NY, USA. Albert Houghton married Louisa Rolph in Dec 11, 1842 mar 55 years in 1900 census. Elvira Walker Houghton married Milton W. Streeter in Aug 15, 1847. Giles Eldrige Houghton married Debby Ann Bacon in May 28, 1846 at Woodstock, Windham Co., CT, USA, JWH: 02 Feb 18? ?, Quincy, IL; MLM: May 28, 1845. Giles Eldrige Houghton married Lucinda M. Gallimore in Feb 5, 1862 at Adams Co., IL, USA, mar 38 years in 1900 census. Jedediah Webster married Diana Houghton, daughter of Nehemiah Houghton and Esther Lawson. Louisa Rolph married Albert Houghton, son of David Houghton and Sarah Comins, in Dec 11, 1842 mar 55 years in 1900 census. Death Jun 4, 1914 Denver, CO, USA, age 77, at the home in Denver of her daughter, Mrs. Valette Woods. 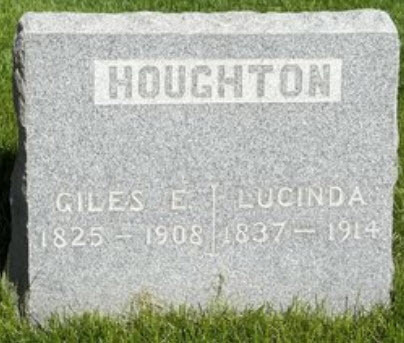 Lucinda M. Gallimore married Giles Eldrige Houghton, son of David Houghton and Sarah Comins, in Feb 5, 1862 at Adams Co., IL, USA, mar 38 years in 1900 census. Debby Ann Bacon married Giles Eldrige Houghton, son of David Houghton and Sarah Comins, in May 28, 1846 at Woodstock, Windham Co., CT, USA, JWH: 02 Feb 18? ?, Quincy, IL; MLM: May 28, 1845. Clarissa Cross Townsend married Henry Bartlett Houghton, son of Nehemiah Houghton, in May 13, 1829. Henry Bartlett Houghton married Clarissa Cross Townsend in May 13, 1829. Henry Bartlett Houghton married Nora Cook in Apr 27, 1857 at Napa, Sonoma Co., CA, USA. Diana Houghton married Jedediah Webster. Lucy Houghton married Nathan Howe Blackmar in Sep, 1843 DAR: 1842. Miranda Houghton married William Howard in Mar 6, 1843 at Woodstock, Windham Co., CT, USA. Mary A. Houghton married Morris Stebbins. Samantha Houghton married Oliver M. Angell in Nov 21, 1852 at Union, Windham Co., CT, USA. Diantha Houghton married Eben Allen in Nov 15, 1850 at Woodstock, Windham Co., CT, USA, MLM: Nov. 21, 1852. Death Sep 3, 1833 ae. 2 yrs. 9 mos. Burial East Cemetery, Union, Tolland Co., CT, USA, Father-Mother. Belenda, their daughter, d. Sept. 3, 1833, ae. 2 yrs. 9 mos. Marcus Taft Houghton married Louisa Johnson in 1859. Marcus Taft Houghton married Charlotte Bills in 1902 at Clark Co., SD, USA, mar 8 y in 1910 census. 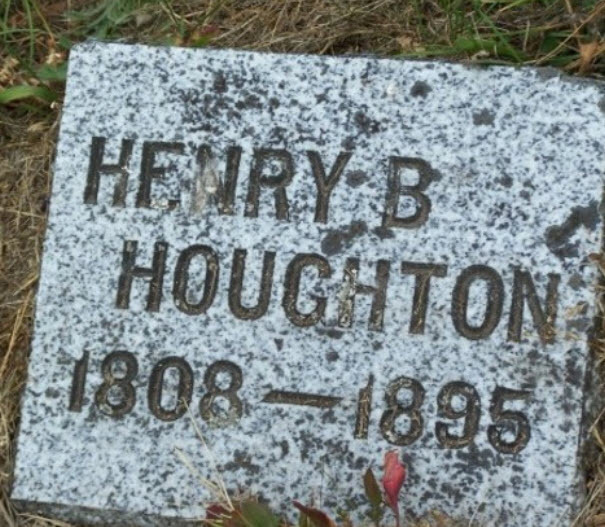 Burial East Cemetery, Union, Tolland Co., CT, USA, Ruth C. Houghton, 1834-1923.